Owasso, OK Ukulele Lessons Near Me | Fun Classes. Top Teachers. Undisputed fact: playing ukulele is lots of FUN! I love playing ukulele. It’s fun, it’s easy to learn, and people get a big kick out of it! Chords are easy to play and the technique is simple. 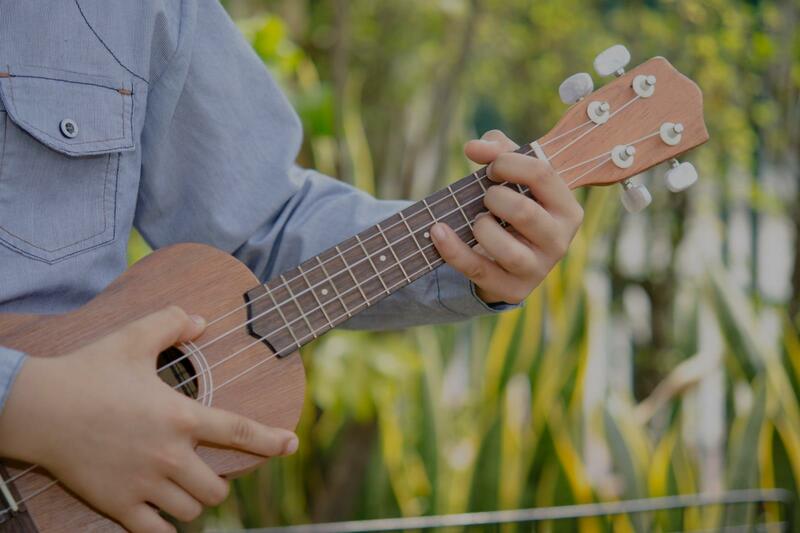 Whether you are picking up an instrument for the first time or adding to your current repertoire, ukulele is always a great choice. Every single lesson is designed just for you. We focus on your goals while having fun playing music together. We talk about good practice habits and how to achieve new heights with your abilities. You learn to play songs that you recognize as well as improvising your own. Together we will discover the many roles that the ukulele can have including rhythms, melodies, fingerpicking, and solos. I will also help you understand the fundamental principles of music. This will take the guess work out of your playing, enabling you to make solid choices with consistent results. My name is Alex, and my passion is teaching music. I offer clients a unique learning experience with customized lesson plans and personalized attention to fit your exact goals and needs. These aren’t just words to me…they are a commitment I make to everyone that I have the pleasure of working with. I earned a Bachelor's of Music from Berklee College of Music where I studied Bass Performance and Composition. I have years of experience playing upright and electric bass in many styles such as rock, jazz, orchestral, and big band. I’ve studied a variety of instruments over the last 20 years including guitar, bass, drums, ukulele, and piano. will enable you to learn to play in any style you choose to study. Ultimately my job is not to teach you to play, but to show you how to teach yourself. I will arm you with a thorough understanding of technique and theory. I love working with kids and adults. I love brand new players with no experience as well as seasoned players who just want to fill in some gaps in their knowledge. Whatever your age, and wherever you’re at with your playing, I hope you will give me the chance to help you have more fun and confidence in music. Every player I work with gets access to a personal online Lesson Journal where you can see my notes from our lessons, do homework from your “Stuff to work on” lists, and access my entire digital library! Every lesson is designed just for you. You can take lessons at my studio, in your home, or online via Skype. For lessons in my studio, I can provide instruments and amplifiers for both of us. There is ample seating for parents to sit in on lessons. Parking is available in the driveway. You’re going to love your lessons! Great instructor ! He knows to shift focus towards what you need to work on. As soon as the instructions are given or the questions he asks you feel relief because the energy is going towards what you already feel you need to work on and not just moving on to the next lesson. The tailored lessons make for a low pressure learning environment to fit your needs. As long as your consistant with receiving his lessons you will get where you want to be with your talents and be jammin out soon. Very knowledgeable, tailored the lesson to my level and very open to anything that I want to learn. I have been playing ukulele for over 10 years and play it professionally on almost a daily basis. I'm extremely knowledgeable in this area of expertise and I'd love to help you from tip to tail, including selecting a ukulele that is perfect for you and in your budget, how to tune, hold, and strum the ukulele, how to make chords, choose songs that are perfect for you, do a few fancy tricks, transport, care for and integrate the ukulele into your life. I love playing the ukulele so much and I know that you will, too! Students will gain an understanding of the anatomy of the instrument, chording and strumming, and how to read charts and learn their favorite songs. I have been Ukulele for over 10 years! My teaching methods help students achieve success because I adjust to each student's needs and abilities individually to create a great experience. I couple traditional teaching with performances offer professional student shows and concerts throughout the year to help enrich the experience! We learn to play many different types of music in different styles keeping the experience new and fun! Learn the fundamentals of music theory and sight reading through an easy to learn and fun instrument, with so much room to improve and take the skills you learn to other instruments in the future. I've played plucked string instruments for my whole life and I ADORE the ukulele. I find it to be the instrument that has the least time before knowing nothing and having fun. It's great to watch students be able to make music so quickly! 3 Common Problems Beginners Face on the Ukulele - And How to Solve Them!